Fun Radio every Sunday live. We play those oldschool dance hits and New Gen Italo. With our 4 cams you get this real interactive feeling. Chat is open. Vinyl is ready to be played… Lets get started! ‘de Haagse Flitsende 5-tig’. 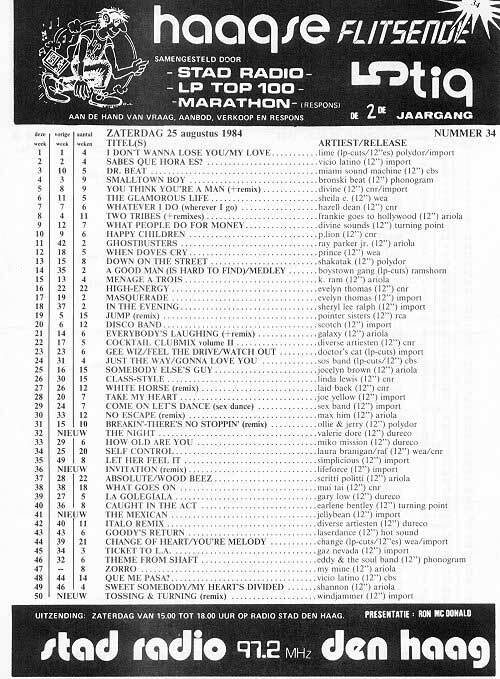 Vandaag de lijst van 2 november 1985. 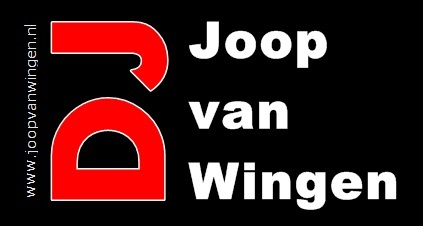 7-8pm CET; Live Italo Mix Set by DJ Renaldo and DJ Joop van Wingen (the Wingman). 8-11pm CET; The sunday night live request show. We are ready to roll. We play the best Italo tracks from vinyl. Ofcourse your requests..hand them in now. Press ‘request’ on top of this page. vanavond hebben wij een studio vol met gasten en leuke mensen. Kom er dus bij, chat en kijk mee. Wij draaien de lekkerste platen en jouw verzoekjes. Gwen 05-11-2017 . Categories: +mix, Charts, clip, Discontinu, DJ Mix, Geschiedenis, Haagse Flitsende 50, Live Show, new release, Nieuws, Stad Disco Zondag, Sunday Live Show, Video, vinyl. Tags: AMD Records, Bobby O, Bordello A Parigi, David Lin, Disco-Mix, Discontinu, DJ Sergio Vamos, DoucheCo, Eurobeat, High Energy, Italo Disco, Italo Internet Radio, Italo Party crew, Italodisco, Iventi Records, Linda Jo Rizzo, Live Request Show, Marco di Luna, Radio Stad Den Haag, Serge Borsboom, SIAE, Spacesynth, Stad Sundaynight Live, Studiocam, Vinyl, Vinylized, Wollebrand Italo. Winter is coming, and we are here for you in every season. So join your gang today LIVE for the best Italo, disco Hi NRG and New music. Je hoort ze weer live, de lekkerste platen uit de jaren 80 en nieuwe muziek. Its request time! 5-7pm CET; Another episode of DoucheCo hosted by Michiel..The best tracks from the classic hit-chart broadcasted on RSDH in the 80s. 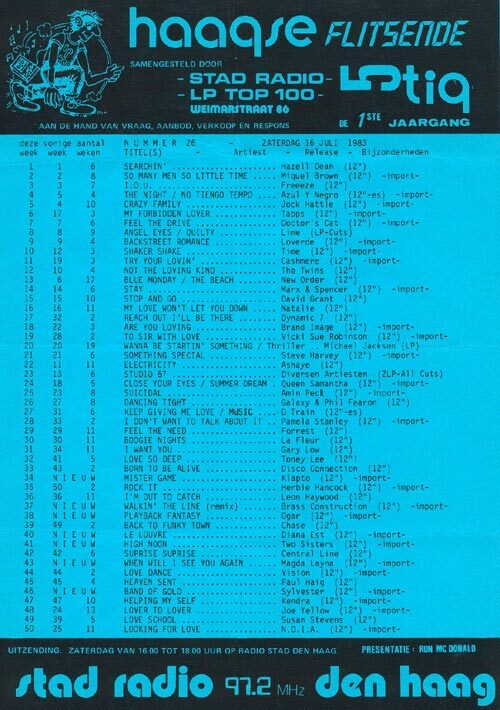 Today the list of 29 october 1983! ‘de Haagse Flitsende 50’. Vandaag 29 oktober 1983. 7-8pm CET; In aanloop naar de Italoparty volgende week nu een mix van DJ Sergio Vamos! / An Italo mix by DJ Sergio. Menno, Gwen and Michiel play ofcourse the best Italo tracks from vinyl. Also this eve a new synthy track that comes out on Bordello a Parigi label called Mr. Pauli, The new Linda Jo Rizzo-Fingertips coming out on AMD Records, a new Bobby O called Dangerous that came out august this year and we are very curious what you think of it. Gwen 29-10-2017 . Categories: +mix, Charts, clip, Discontinu, DJ Mix, Geschiedenis, Haagse Flitsende 50, Live Show, new release, Nieuws, Stad Disco Zondag, Sunday Live Show, Video, vinyl. Tags: AMD Records, Bobby O, Bordello A Parigi, David Lin, Disco-Mix, Discontinu, DJ Sergio Vamos, DoucheCo, Eurobeat, High Energy, Italo Disco, Italo Internet Radio, Italo Party crew, Italodisco, Iventi Records, Linda Jo Rizzo, Live Request Show, Marco di Luna, Radio Stad Den Haag, Serge Borsboom, SIAE, Spacesynth, Stad Sundaynight Live, Studiocam, Vinyl, Vinylized, Wollebrand Italo. *Fantastico! Het is weer zondag. Zijn jullie klaar voor uren lang heerlijke muziek? Kruip maar dicht tegen je radio aan, de beste Italo’s, mix sets en nieuwe muziek. ** We bring heat! The best live shows on a sunday. So sit down, relax and enjoy our programs today 🙂 We bring as allways the best Italo’s from vinyl, charts and New Gen! 8-11pm CET; The sunday night live request show party time. We celebrated Menno ‘s birthday tonight with lots of friends in the studio and you were invited 🙂 / Menno viert zijn verjaardag in de studio vandaag..is dat even gezellig. Thanks for a busy chat and lots of viewers. We played a spacesynth compilation made by Marco di Luna, a small lecture on the track Pulstar. And music a.o. from Lisa, Vivian Vee, Odessa, Wishkey, Mirko Hirsch, Italove, Paul Parker, Carino Cat, Victor Ark and Also 2 tracks from the new album Vinylized vol 3 that contains tracks from Raffaele Fiume, Raf Coney and Joey Mauro (AMD Records) thanks to David Lin. Enjoy the recordings! Gwen 15-10-2017 . Categories: +mix, Charts, clip, Discontinu, DJ Mix, Geschiedenis, Haagse Flitsende 50, Live Show, new release, Nieuws, Stad Disco Zondag, Sunday Live Show, Video, vinyl. Tags: AMD Records, David Lin, Disco-Mix, Discontinu, DoucheCo, Eurobeat, High Energy, Hypnosis Ian Coleen Thorsten jacob Pulstar, Italo Disco, Italo Internet Radio, Italodisco, Iventi Records, Joey Mauro, Live Request Show, Radio Stad Den Haag, Raffaele Fiume, SIAE, Spacesynth, Stad Sundaynight Live, Studiocam, Vinyl, Vinylized. Back on Air! Tune in for our live shows starting 5pm CET. The best way to end your weekend. 5pm CET- DoucheCo with Michiel van der Brugge. He plays the best track from the classic hit chart broadcasted on RSDH in the 80s. Today august 25, 1984. De beste platen uit de legendarische ‘Haagse Flitsende 50’ chart hoor je in DoucheCo met Michiel. Klik HiERRRR om de lijst van vandaag te zien. Vandaag 25 augustus 1984. 8 till 11pm CET- The sunday night live request show. Menno, Gwen and Michiel play your requested songs! use the request button on top. Menno will bring his choice of vinyl so expect classic Italo, Disco and New Gen Italo music. Also this eve a teaser medley of ‘Vinylized’ by AMD records. New colored vinyl limited available. Join our chat and get in contact live with us in the studio. We make it your night out! De week vliegt voorbij. Menno Gwen en Michiel zitten er weer klaar voor. Lekker plaatjes draaien, drankje erbij, en jij natuurlijk met al je suggesties. Stuur ze in via de request button. De spacesynth van deze week draaien wij natuurlijk ook en een medley van Vinylized 1 & 2 welke nu beperkt uit is op AMD label. Gwen 27-08-2017 . Categories: +mix, +Stad Disco Zondag, Charts, clip, DJ Mix, Download, Haagse Flitsende 50, Live Show, new release, Nieuws, vinyl. Tags: 80's, 80's disco mix, AMD Records, Charts, David Lin, DoucheCo, High Energy, Italo Disco, Italo Internet Radio, Iventi Records, Live Request Show, Radio Stad in the Mix, Savino Deejay, Spacesynth, Stad Sundaynight Live, Studiocam, Vinyl, Vinylized.